Just over a kilometer from the busy downtown of Prince George, B.C., lies a deep ravine. The area is shrouded in silence where stillness is broken only by chattering squirrels or chirping birds. Windfalls, uprooted trees, underbrush, foliage and years of fallen leaves almost completely hide what remains of a Lightning aircraft, while devil's club and thistle protect the site from all sides. The wreckage: portions of wings, fuel tanks, propellers and engines, is scattered over the area. Those engines roared to life for the last time fifty years ago on June 25, 1956. Frank Pynn, a 32-year-old former Royal Air Force Transport Command pilot left the lounge of a local hotel around 5 o'clock in the afternoon. He and his navigator/photographer, Bruce Hill, 30, had spent a few hours there enjoying a few beers. Pynn was a competent flyer with absolutely no lack of confidence. He was licensed to fly in England, Canada and the USA. During his flying career, he accumulated around 4,000 flying hours, in excess of 20 them on the P-38 Lightning. After the Second World War, he and his family moved to Canada. He has been flying on air-survey projects since 1947. 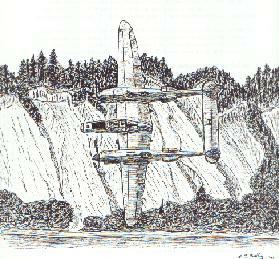 Pynn was equally at home at high altitude or at the low level precision flying that was required to drag a magnetometer over mineral-rich northern Canada. He and the crew arrived to Prince George on June 13 from Los Angeles. The Lockheed L-5G Lightning (photo-reconnaissance version of the P-38 fighter) was chartered by the Federal Government from Vancouver Aero Surveys Ltd., a subsidiary of Fairchild Aircraft of California, to photograph some 600,000 square miles of northern Canada from Edmonton to the Queen Charlotte Islands. The job was expected to take two months. It was a job, in Pynn's words, "of extreme monotony punctuated by moment of sheer terror." On that Monday afternoon, Pynn started to head for the airport to pick up the mail for the crew. He never got the mail. No one knows why, somewhere between the town and the airport, he decided to take the Lightning out of the hangar and fly it. Perhaps to check the plane's radio equipment that had been defective a few days earlier and had been repaired by Allan Clarke, radio operator for the Department of Transport in Prince George. Pynn checked with Clarke when he arrived at the airport. Clarke had detected the smell of alcohol on Pynn's breath but believed he was sober because the way Pynn could discuss with him the intricacies of his radio indicated to Clarke that Pynn was "in full possession of his senses." Pynn, with his impending flight in mind, casually asked if anybody wanted to accompany him. Clarke's 15-year-old son, Jimmy, who had just arrived back from a Vancouver boarding school on the bus couple of hours earlier grabbed the opportunity. He loved airplanes and this was his big chance to fly for the first time, on top of it, in one of World War II's hottest aircraft. The Lightning had been readied for the next day's mission and it was fully loaded with fuel, including the auxiliary tanks. Pynn and the youngster climbed into the plane (Jimmy sat behind the pilot in the piggy-back seat) and taxied out for take-off. The pilot's radio transmission reached Clarke loud and clear. Clarke gave the take-off clearance. He noticed that the pilot seemed to take an unusually long time over his cockpit check, but finally released the brakes and made a normal take-off. The Lightning returned over the airport a few minutes later in a "screaming dive" and "shot up" the airport. According to an eyewitness, Pynn approached the administration building at a height of "not more than 15 or 20 feet" above the ground level and cleared the control tower "by only a few feet". Then he turned toward the town. Hundreds of city residents saw the Lightning roar over the houses at low level. Low it was indeed! Ball players on a field (now the site of the Civic Centre) "hit the deck from fright" as the Lightning zoomed dangerously low overhead and then clipped a tree in the Winnipeg Street area. People attending a wedding reception in one of the halls ran out to the street to see �what the hell was going on.� The screaming sweep over the city at a height of only about 45 metres alarmed a large segment of the population. The airport office of Canadian Pacific Airlines received a telephone call about the antics of the plane but the report ironically and tragically was never relayed to the only person who could contact the plane and ask Pynn to return to the airport or at least confine his flying to higher altitude, Mr. Clarke. But Clarke was not aware of the situation and the only people who could have told him did not think it was necessary! Meanwhile, the Lightning was heading east toward Six Mile (now Tabor) Lake made a sweep over it then swung back toward the city crossing the Fraser River near the PGE (later BC Rail) bridge. It just missed the top of the Prince George Hotel as it headed toward the cutbanks of the Nechako River. Eyewitnesses' accounts differ on what happened next. The Lightning roaring toward the cutbanks went into a half roll, seemed to fall over on its back and nosed toward the ground. Before the plane hit the trees, the throb of the engines mounted to a brief roar indicating that the pilot was trying to get the nose up by applying more power. But it was too late. "A tongue of white flame leaped 200 feet into the air, there was a muffled explosion, like thunder, and black smoke wound up of the trees." The tragedy happened approximately two minutes after 7 o'clock. Police and BC Forest Service personnel found the smoldering remains of the aircraft in a deep ravine. The scene was one of appalling destruction. Hardly a single component of the plane was readily recognizable. The largest piece was little more than two metres in length. Charred remains of the parachute were hanging grotesquely from the branch of a tree. Reconstruction of the few seconds leading up to the crash from salvaged portions of the aircraft was impossible. "Evidence at the scene of the crash showed that the plane dove almost straight into the ground shearing the tops of only a handful of small saplings in its descent." Ironically, as it turned out later Pynn's mechanic, Ray Barrows, had already picked up the mail at the airport on that tragic day and was heading to town. He must have passed Pynn on the road without seeing him. Chances are if they had met and Ray had been able to give Frank his mail there would have been no flight that day. The inquest found that Pynn died "through his own neglect and complete disregard for the Aeronautical Regulations of Canada." Though the cause of the accident is not clear there is some explanation why the Lightning went out of control. Basically the auxiliary drop tanks were designed for long-range, upright, level flights. They were not intended to be used in a situation when the aircraft would be rapidly maneuvering and subject to high g-forces. So when Pynn tried to attempt a rapid maneuver the plane stalled out. In the inverted position the drop tanks blocked the airflow over the wings and the wings stopped producing lift entirely. Once the plane stalled out and rolled inverted there was insufficient altitude to recover. Frank Samuel Pynn was born July 6, 1923 in Manchester, England. During the war, he was trained as a pilot for Bomber Command near Edmonton, Alberta, Canada. After his training, he ferried aircraft from Canada to England. Between ferry flights, like many other off-duty airmen, he would relax in English pubs. Nineteen-year-old Audrey Levey was a Manchester born young woman who worked in the Fairchild Aircraft Co. Ltd.�s factory. One evening, after work, one of her co-workers took her out to a pub and introduced her to a young airman he knew, Frank Pynn. Pynn was a typical good-looking flyer who stood more than six feet tall. This meeting was the beginning of a romantic relationship. During their courtship, Pynn continued to fly for Transport Command to places such as Canada, the Bahamas, Egypt, India and parts of Africa. Most of the time he was ferrying twin-engine B-25 Mitchell aircraft. He also took part in food and supply dropping missions in Burma to supply Wingate�s commandos. Pynn received the Distinguished Flying Cross (DFC) for his service to his country. Frank and Audrey were married in October 1945, when Audrey was 21 years old. A year later, their first son, Howard, was born in October. Their second child was a girl. The Pynn family moved to Stayner, Ontario, Canada, in November 1947. Tragedy struck the family when their 19-month-old daughter, Ruth, died of Spina Bifida. Their second son, Greg, who was born in Canada, was only six weeks old at the time. Pynn flew all over most of Canada. According to Audrey �he was crazy about flying�. He flew as a co-pilot for a company that did geological survey flights over Baffin Bay and Ellesmere Island area at the beginning of the1950�s when the DEW (Distant Early Warning) Line was established. Frank was flying for Spartan Air Services when the Pynn family lived in Ottawa. Until their boys became school-aged, Audrey and the kids accompanied Frank wherever work took him. Among other places they went to Ft. St. John and Ft. Nelson in British Columbia. However, when the boys started school Audrey stayed home with them in Ottawa. It was in the nation�s capital that Frank read an ad in the paper offering a �chief pilot� position in Vancouver, B.C.. He applied and got the job. He also found out that the company, Vancouver Aero Surveys Ltd., was a subsidiary of Fairchild Aircraft of California. He was to spend a year with Fairchild in the Los Angeles area, and then he would be transferred back to Vancouver, provided he passed the requirements for the position. The Pynn family moved to Van Nuys, CA in 1955. Bruce Hill, Pynn�s navigator, visited the family and handed over Frank�s partially burned wallet that contained several photographs, all of them slightly singed around the edges. Frank�s death hit the family hard. Young Howard smashed 30 or 40 of his model planes. Some years later, Audrey Pynn married Earl Watkins whom she had met during the war years in England where Mr. Watkins was recuperating from the wounds he received in Normandy. Mrs. Watkins, now in her eighties, reside in Indiana, USA. Howard Pynn served in the US Air Force after graduating from high school, but he did not choose flying as a career. He has four children, a son and three daughters (including a set of twins). Greg Pynn has three sons. Bruce Hill, navigator/photographer was originally from Saskatchewan but resided in Vancouver, B.C., for most of his life before moving to California in 1952. Prior to joining Aero Surveys in Vancouver, he was attached to the Air Arm of the Royal Canadian Navy. Ray Barrows was the mechanic from Colorado. He was a former test engineer for Lockheed Aircraft Corporation and was working for them when most of the planning for the P-38 was being carried out during the war. James Allen Clarke was born on January 10, 1941 in Nelson, B.C.. Jimmy was the only child of Allen and Margaret Clarke. He was attending Athlone School for boys in Vancouver, B.C.. Jimmy was buried on June 29, 1956 and former playmates from the airport were his pallbearers. CF-HSC was removed from the Register on September 26, 1956. Jane's Fighting Aircraft of World War II. All rights reserved. No part of this publication may be reproduced, stored in a retrieval system, or transmitted by any means, electronic, mechanical, photocopying, recording or otherwise without prior written permission of the copyright holder.